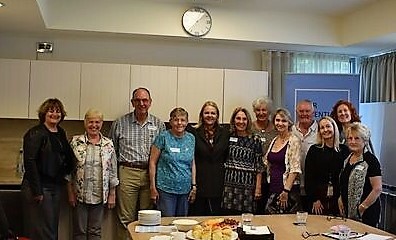 Noosa Care''s Dementia Friendly Advisory Board. An advisory board set up to make Noosa more dementia friendly is about to release a Memory Support Pack to assist people who have been newly diagnosed with dementia and their families. NoosaCare’s Dementia Friendly Community Advisory Board was established about nine months ago to meet the community needs of the increasing number of people living with dementia and join the country’s dementia friendly movement. According to Dementia Australia there are almost 450,000 Australians living with dementia with the number expected to increase by 35 per cent by 2028. It is the second most common cause of death and in 2016 became the leading cause of death for Australian women, surpassing heart disease. NoosaCare’s Dementia Friendly Community Advisory Board is comprised of people living with dementia, their loved ones, medical professionals, volunteers and community leaders including Noosa MP Sandy Bolton and Noosa Councillor Ingrid Jackson. “A diagnosis of dementia can be overwhelming and anything we can do help people living with dementia and their families is a priority for the advisory board,” Cr Jackson said. “The board’s vision for the support pack is to make it easier for community members to access the information and services they need after a diagnosis as well as give them direction at a stressful and emotional time.”Ms Bolton said it was up to all of us to take a moment, slow down and empathise with those around us. “It is especially important for anyone working in service industries, including retail and hospitality, to re-interpret what may be seen as a difficult customer to one that is experiencing frustration, anger and confusion as a result of a condition that can affect any single one of us, or someone we love dearly,” she said. The Memory Support Pack includes a check list and contact list of local and national services to help people with their dementia journey. It will be available online via the NoosaCare website at https://noosacare.com.au/dementia-care/, through Sandy Bolton MP and Cr Ingrid Jackson’s Facebook pages and some medical clinics.